While there’s no question that Devo is certainly one of the most innovative and unconventional bands in the annals of popular music history, oftentimes they unfortunately (and undeservedly) get lumped into the “one hit wonder” category due to the monster success of “Whip It” and its iconic video. You couldn’t turn on MTV in the early 80s without seeing Devo’s distinct black sleeveless turtleneck and red energy dome combo. However, as the re-release of The Men Who Make the Music (out August 12) makes abundantly clear, there is certainly more to the New Wave pioneers below the surface of those yellow jumpsuits. Devo created The Men Who Make the Music as their first home video release back in the visionary VHS days of 1981. While it was actually completed as early as 1979, its release was held up by label execs for its “anti-music industry content.” When it finally got released two years later, it immediately became a cult fan favorite. After its initial release, original copies of the tape were hard to come by and rarely sold for less than a couple hundred bucks. However, the fine folks over at MVD are making The Men Who Make the Music available again and thankfully this time it’s on DVD – though don’t expect any sort of visual sprucing up as it still contains the time-appropriate graininess that adds to its charm. 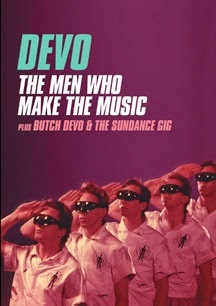 The DVD contains the full 49-minute The Men Who Make the Music in its original state and included as a bonus is Butch Devo and Sundance Gig, an hour-long live concert from their 1996 closing slot at the Sundance Film Festival. As Devo’s first video release, The Men Who Make the Music is certainly not short on character and charm. Mixing concert footage from their 1978 tour with music videos and quirky interstitial segments that look straight out of a 70s-era Saturday Night Live skit, the video ends up being both a cool snapshot of Devo’s early years and an interesting time capsule for the New Wave quirkiness of the late 70s. The live performances do a fantastic job of showing that Devo is more than just a fun-loving, experimental band looking to shock people with gimmicks and antics. Songs like “Uncontrollable Urge,” “Smart Patrol/Mr. DNA,” and “Red Eye” showcase Devo’s impressive mix of idiosyncratic guitar-and-bass lines, wiggly synth splashes, and punk rock energy. The music videos showcase Devo’s one-of-a-kind personality and their off-beat sense of humor. The opening video for “Jocko Homo” features frontman Mark Mothersbaugh doing a wonderfully disjointed dance that would give David Byrne a run for his money and the rest of the band’s sunglasses-under-pantyhose look is both delightful and disturbing in equal measure. The interstitial segments work as transitional pieces that thread a (very, very) loose narrative throughout the video, showing such things as Devo’s woes in the face of “Big Entertainment” and their tongue-in-cheek philosophy of “reductive synthesis” that allows them to “remove the gooey cellulite in modern music.” There’s only one Devo and The Men Who Make the Music wonderfully proves why. The bonus half of this release is Butch Devo and Sundance Gig, a concert video featuring Devo’s January 26, 1996 closing set at the Sundance Film Festival in Park Slope, Utah. Shot almost 20 years after the concert footage in The Men Who Make the Music, it’s really amazing to see the same (or possibly even more) energy and passion coming from the band as they blaze through a stunning setlist of fan favorites and early Devo material. Of course, the band is also decked out in matching striped prison suits because… why not? Bassist/co-founder Jerry Casale described the show by saying, “In January of '96, we closed Sundance Film Festival. We wore 20s style prison suits and dished out classic Devo songs to an unsuspecting audience of Hollywood elite." From the opening thump of “Too Much Paranoias” to the closing sing-a-long of “Beautiful World,” Devo never slows down musically or physically. There’s even the occasional herky-jerky, full-band choreography in the midst of all the wonderfully weird riffs and off-kilter rhythms. Devo performed a wide variety of their best-loved tracks here, with “Girl U Want,” “Jerkin’ Bank and Forth,” “Jocko Homo,” and their kooky cover of The Rolling Stones’ “(I Can’t Get No) Satisfaction” being absolute standouts here. As a personal bonus, they also played a frantic version of my favorite Devo track, “That’s Good” that I was super jazzed to see. With the knockout one-two punch of both The Men Who Make the Music and Butch Devo and Sundance Gig presented here, this DVD comes with a hugest of recommendations from me. Apart from a few of the videos on MTV, I never saw any of the original material from The Men Who Make the Music before. So I can honestly say that you don’t need to have seen it back in 1981 to enjoy it now. This DVD is a wonderful treasure trove for Devo fans, as well as for popular culture fans that will dig the nostalgic time capsule vibe of the creatively unhinged music videos and interstitial segments. The Men Who Make the Music will be released on August 12 and can be pre-ordered from MVD here.